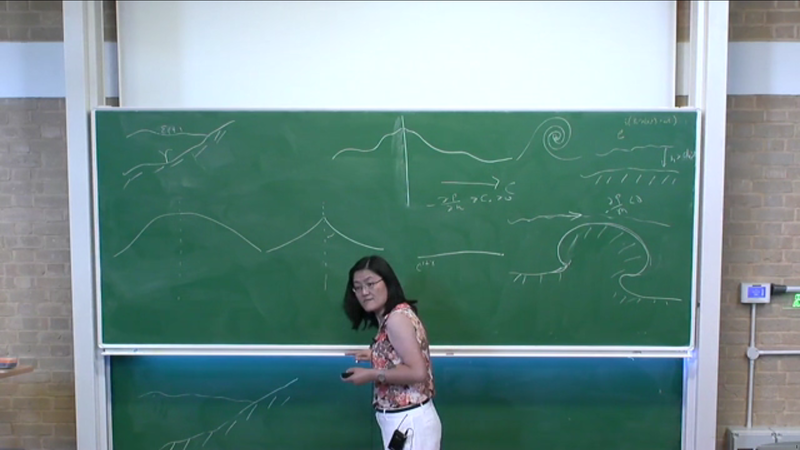 On Thursday afternoon, 24 July, Sijue Wu gave a talk on her new results on large amplitude water waves with crest angles less than a right angle. She started by reviewing the existence theories in the literature, and how they rely on the Taylor condition: negative definite normal pressure gradient at the surface. Then she asked the question: what happens when the Taylor condition is relaxed? A key observation is that relaxation of the Taylor condition allows for acute crest angles. Indeed, the pressure gradient is identically zero at points on the surface where there are acutely angled crests. A proof of existence is presented by first transforming using conformal mapping, and then using analysis in Sobolev spaces. A key to the proof is an estimate based on a new “energy”. Ocean observations were presented in support of the theory. A preprint on the new class of self-similar 2D surface water waves can be found on the arXiv. A video of the talk is available here.